We don't believe in benches. Teamwork makes our dream work! A Paris middle school athletics experience is like no other: we don't do "cuts" and we don't "bench" players in favor of "winning." OUR definition of winning equals more than the score. Our policy of inclusion means ALL students are welcome to participate, no matter their skill level. The benefits of this inclusion are remarkable: Paris School athletes who excel jump in to assist those who are more challenged. 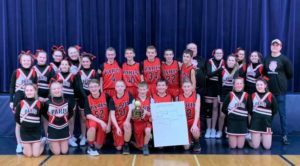 Paris School athletes work together to make sure every teammate has a chance to make a basket or lead a cheer. Paris School athletes discover that celebrating together feels good and helping a dejected teammate feels better. And, together, Paris School athletes learn that wearing a red, white, and black uniform means they are a part of something very special. As our athletes grow through our middle school athletics program, their commitment, leadership skills, and maturity also grow. The court and the field become the stage on which life skills are tested. We are proud that our Paris School athletes carry positive experiences, valuable skills, and great memories to high school and beyond!